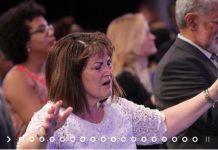 The Healing School is a healing ministry of Pastor Chris Oyakhilome PhD, where people from all walks of life are brought together to learn about the reality of the Gospel of Jesus Christ. There, they witness the power of God’s healing through His Word, by the anointing of the Spirit. Healing School sessions create a platform for thousands of people to receive healing and miracles in an atmosphere of faith and to bask in the presence of the Holy Spirit. There are two Healing Schools, in Johannesburg (South Africa) and Toronto (Canada), which both hold free Healing School sessions annually (Spring Session and Autumn Session). Through the power of Jesus Christ, Pastor Chris Oyakhilome has been able to help countless people heal with the operation of the gifts of the spirit. It is thanks to him that many people from around the world have been given hope where there was none, given relief where there was only pain and sent joy where there was only sadness. It is through the Power of God that the miracles and wonders of the biblical times are constantly witnessed and reenacted at the Ministry’s Healing School. These constant wonders serve as a proof of the unchanging power and presence of the Lord up till now and until the end of time. We are truly blessed to have Pastor Chris Oyakhilome to bring healing and miracles to the nations of the world. It is also a great honor to receive and welcome guests of high esteem via our annual special minister’s visitation program affording these honored guests the chance to witness firsthand the wonders and miracles performed in our midst. These remarkable healing experiences are shared by the leading TV show “Enter the healing school with Pastor Chris” which has accumulated a huge following from millions of devoted and enthusiastic viewers on several satellite and terrestrial TV stations worldwide. This includes numerous testimonies of those who were fortunate enough to receive healing. into ambassadors of the Gospel of Jesus Christ through special forums, excursions and exciting camp activities. Youth from all around the world interact with one other to build new and exciting friendships, inspiring each other to do more in the name of Jesus Christ. Some highlights of the International Easter Youth Camp feature extraordinary teachings and impartation meetings with the Man of God, Pastor Chris, moving the youth to change the world with the Gospel.